ANOTHER blow to national pride: on January 13th DBRS, a Canadian rating agency, downgraded Italy’s sovereign debt, stripping the country of its last A rating. Government bond-yields rose; so will the cost of funding for Italian banks. Erik Nielsen, chief economist of UniCredit, Italy’s biggest lender, calls the extra €5bn ($5.3bn) or so banks will have to put up as collateral for their loans from the European Central Bank (ECB) “immaterial”. Still, it is a burden they could do without. Weighing heaviest on bankers’ minds is a planned state rescue of Monte dei Paschi di Siena, now Italy’s fourth-largest lender. A private recapitalisation scheme collapsed in December, prompting it to seek government help. Days earlier, anticipating the plan’s demise, the state had created a €20bn fund to support ailing banks. Next month Monte dei Paschi’s chief executive, Marco Morelli, will present a new business plan. On January 18th he confirmed to a Senate committee that 500 branches and 2,450 jobs will go within three years. Soon the bank is expected to issue a state-backed bond, for perhaps €1.5bn, to shore up liquidity; it hopes eventually to raise €15bn to replace deposits that bled away last year. Once the plan is out, negotiations between Italy and the European Commission will ensue, over the first state rescue of a big bank since the commission tightened state-aid rules. Between 2007 and 2014 the commission approved €5trn-worth of state aid, including guarantees, for banks. Italy’s share was a piffling €130bn. But “bail-in” has since replaced “bail-out”. The Bank Recovery and Resolution Directive, which came fully into force last year, demands that banks receiving state help be put into “resolution”—in effect, bankruptcy. Shareholders and junior creditors cop it, for at least 8% of liabilities, if the state steps in. 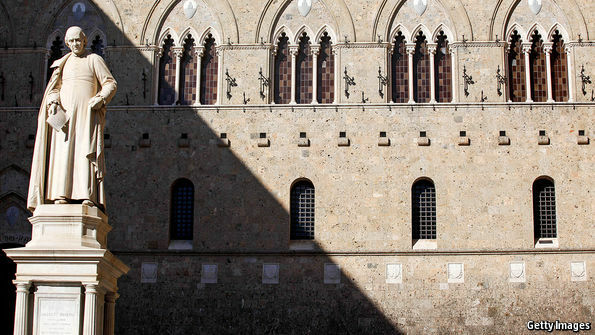 For investors in Monte dei Paschi, the outlook may not be so bleak. The government plans a “precautionary recapitalisation”—allowed by the directive. To qualify, a bank must be solvent; the injection must be on market terms; and the capital must be needed to make up a shortfall identified in a stress test—such as one Monte dei Paschi failed last summer. That would imply “burden-sharing”, converting junior debt to equity, rather than a bail-in. Separately, retail investors who were “mis-sold” subordinated bonds may be compensated. The world’s oldest bank, Monte dei Paschi was founded in 1472 by Sienese magistrates. Its recent history has been an ignoble shambles. With exquisite timing, in 2007 it bought Antonveneta, another Italian bank, from Spain’s Santander for €9bn in cash. Further blunders followed. It has had two capital increases since 2014. In the year to December 23rd, when the private rescue failed and trading was suspended, its share price fell by 88%. How much help it needs now remains unclear. The private plan, devised in July, would have stripped out and securitised €27.6bn-worth (gross) of non-performing loans and recapitalised the bank with €5bn. After it failed, the ECB told the bank that its capital shortfall, under an “adverse scenario” in the summer’s stress test, had widened to €8.8bn. But the capital required will depend on Mr Morelli’s revised plan, and in particular on what will be done to clean up bad loans. The conversion of bonds to equity could raise €4bn, but retail investors, who have around €2bn-worth of bonds and are in line for the same value in shares, may then be eligible for compensation. The government’s total bill could amount to around €6bn. Pier Carlo Padoan, the finance minister, says the banking system is turning a page. If he is to be proved right, Monte dei Paschi must be sorted out. Yet other signs are encouraging. On January 12th UniCredit’s shareholders approved a €13bn share issue, part of an overdue overhaul. Last year was the first since 2008 in which banks’ total non-performing exposures declined, according to PwC, an accounting firm. ABI, the national banking association, and Cerved, a ratings agency, predict that by 2018 bad loans will almost be back to their pre-crisis level—although that may depend on what happens to Monte dei Paschi. The plan to securitise its portfolio was intended to kick-start a market in duff debt. Italy’s fragmented banking industry is also consolidating. The resolution in November 2015 of four tiny banks, in which bondholders were bailed in, caused uproar. Now UBI Banca, the fifth-largest lender, hopes to buy three of the four “good” residual banks for €1. 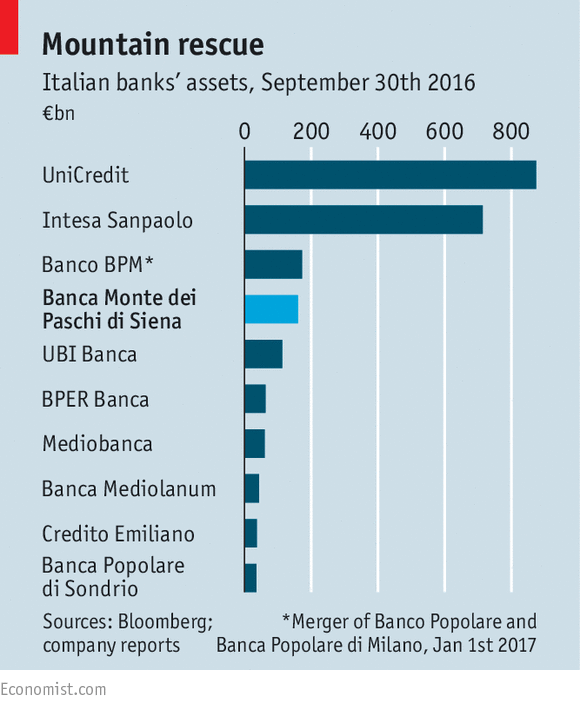 A merger finalised on January 1st created Banco BPM, now Italy’s third-biggest bank. Another is on the horizon, of two Venetian banks. Analysts at Credit Suisse suggest that the government’s €20bn fund should suffice to plug any remaining capital gaps. All this is necessary—but not sufficient. Most banks need to slash costs and get rid of dud loans. With interest rates in the cellar, revenue is hard to find. And without stronger growth than Italy’s recent pitiful record, many lenders will find life a grind. Forecasters say GDP will expand by just 0.7% this year and 0.8% next. The vicious cycle will be hard to break. Donald Trump is now the new President of the United States of America (USA), such as it is, where libertarians and conservatives should be rejoicing - right? Well, maybe if he's able to repeal Rule 41 and is able to right off a lot of debt without imploding the financial system (not possible) - yes - one must agree. However this is all speculation at this point - as is all the optimism associated with Trump, where like Reaganomics, Trumponomics, is expected to 'reignite' the US economy after 30-years of an aggressive hollowing out. Yup - everything will be 'wonderful' with a 'businessman' at the helm of the world's largest and most important economy. He can reverse all that damage in no time. Oh and by the way - the rest of the world - you're on your own - because it's America first with Trump - nationalism to the max. What should be noticed by all however, and the other side of the coin to a sanguine view of the future for our collective political economy, is this sentiment, Trump's 'America first' doctrine, has not been lost on both domestic businesses or America's trading partners, with China's undoubtedly most important from a macro perspective. Thing is, from an unintended consequences perspective, because Trump is like a 'bull in a china shop', aggressive protectionist policy could bring reprisals from the Dragon, from a dragon in the 'Year of the Rooster' - circling back to remind of Trump. In Chinese zodiac, it's a year that looks to the color gold and metals for 'good luck', which ironically could end up being China's trump card to teach The Donald a lesson in diplomacy. Heaven knows if recent comments from Trump's Secretary of State are an indication of the wild statements (and actions?) we should expect, there's every reason to think it might 'hit the fan' one day with China, where events could spiral out of control quickly. How will it start? The first shots in any war past initial aspersions are always economic, which is where China could really make trouble for Trump's Presidency if it so chooses. How's that? Well, how about unleashing the Chinese population on dwindling global physical gold and silver supplies. How about global stock market volatility spiking demand for physical precious metals rendering US (price setting) futures markets redundant, sending prices shooting higher - along with inflation expectations and interest rates. How about them apples? Do you think this would get Mr. Trump's attention? Think maybe he might ruminate a bit more before he hangs his 'tough guy routine' on China next time? Don't get me wrong, as the globalist China agenda and their increasingly aggressive posture is 'big trouble' for the US if left unchecked at this point, however that said, diplomacy is very important in such matters. So it will be telling to watch what happens in Davos this year with the Chinese President scheduled to attend for the first time. Trump's team better pour on the charm, and attempt appeasement - or The Year of the Rooster could turn out to be a real doozy - if not sooner - later. Because as you would know from my technical work on the precious metals markets, while the first half of the year should see further consolidation in the group - after that - anything goes. As it turns out, Xi carried on with the case for Chinese global leadership (see here and here), and threatening trade wars (see here and here) with crickets from the US. How it appears is Trump is talking currency / trade wars too, within the context of the America first meme, which shows both sides of this equation are sticking to increasingly aggressive postures, which will eventually need to blow. So the big question then becomes how does process unfold, where logically economic war should escalate forthwith. So it appears Trump's honeymoon might not last long at all, with enemies both foreign and domestic turning the screws from day one. He had a nice inauguration day celebration on Friday - but it won't last. The only problem is it won't - the peace won't last long at all. And given just how vulnerable both sides are - America and China - the resulting war will not be pretty. The headlines tell the story(s), where in the States, despite the Trump Effect propaganda circulating, still, if you're really looking you will see the increasing unemployment (see here and here), demographic disparity and despair (see here and here), along with outright financial collapse (see here and here) evident across the American landscape. Heck, it's even hitting New York now, evidenced in collapsing real estate prices - that can only be papered over with exploding deficits moving forward. Indeed, 'America' has become an illusion; however going to war with China will test the fallacies for real before it's all over. And although China is not better off when one looks under the hood (see here and here), still, it does have some advantages over the US that can matter in a 'dog fight', not the least of which being unparalleled economic growth over the past 10 years, and a corresponding foreign currency reserve 'war chest', top in the world. So the Chinese have quite an economic advantage over America at the moment, and could start squeezing in other ways if tensions begin to heat up, which again, appears fait accompli with anti-globalist Trump in the Whiter House now. In this regard then, it would not be surprising to see an emboldened China take surprising and bold actions that play of their economic prowess in the Year of the Rooster, which again, as mentioned above, is a year involving gold and metals. Wouldn't it be 'funny' if China unleashed increases percentages of its still bountiful currency reserves on gold and silver bullion, with emphasis not on the former, but the latter considering its strategic importance to America's interconnected markets. As you would know from reading my reports on silver throughout the years, silver is not just important to the maintenance of the larger credit bubble - it's everything. The entire financial repression game, with interest rates at center, depend on keeping silver subdued, because of key inter-market relationships with gold (currencies), bonds, and equities, where radical change would unhinge the derivatives markets employed to manage the larger pricing nexus. So if China really wanted to hurt the US, all it has to do is set silver free from its COMEX shackles, the primary price-managing instrument used to keep prices under control. And there's only one way to do that - buy it all (which they could do with trillions in foreign currency reserves) - or at least make global price differentials so substantial arbitrage becomes a 'no brainer' for the billionaires of the world. Then a 'buying panic' would ensure that would accomplish the same goal - it would clean them out - even JP Morgan's stash. It wouldn't take much if a true panic to accumulate physical silver ever takes hold, where momentum would eventually bring in all varieties of funds (sovereign, hedge, pension, etc. ), not to mention the public. It wouldn't take much at all once it gets rolling - especially with Trump shaking things up. What's more, think about the positive strategic logistics for China resulting from such a move (something warring nations strive to accomplish), killing two birds with one stone by removing what little credibility the $ has left, while bolstering it's own fortunes (currency reserves) with all the gold and silver they own. All they would need to do in order to torpedo the $ after such a move is turn the focus on the bogus gold reserves the US doesn't have while prices for the metals are going crazy - where an element of truthiness would enter the formula even if this bullet is dodged (temporarily?) while this is happening - that's war. That's the kind of thing you should expect as tensions between the US and China escalate - as China continues to attempt its silent coup of the West - aimed at taking control of global finance. This is why Xi showed up in Davos this year, and why Chinese elites are buying up Hollywood - to take full control of the American mind - just as they have done with their own people. So make no mistake ladies and gentleman - it appears things are heating up in the global chess game - and this time America will likely not come out ahead. And Obama's selling out of America to the globalists over the past eight-years will only help China in this regard, especially if Trump fails in his attempt to 'make America great again' (a pipe dream? ), which is quite possible. So let's hope Trump is able to take control of the situation before it takes control of him, where there's only one way to accomplish this feat - by bringing back the rule of law. This is the only way you will avoid waking up one day having to pledge loyalty to somebody that doesn't look, think, or act like you. What's more, besides gold and silver being 'political metals', inviting speculation they may soon be drawn into potential 'economic wars' moving forward (Bitcoin too), it's important to understand that it's also likely that one way or another Trump's policies (the other Rooster) will increasingly play hard on the $ ignoring all other factors, so again, don't be caught short. While 'conventional charting' of paper precious metal pricing patterns are suggesting to remain cautious right now, still, at the same time strong core positions are the prescription based on knowing how things are heating up, not to mention the $ chart, which is decidedly bearish. So somebody is lying to you here, either the precious metals charts, which are suggestive the larger degree corrections that started in 2011 are incomplete, or the $ chart - oh yes - and the fundamentals - you know - that cumbersome 'stuff' that doesn't matter in the financial markets today. Thing is, the false narratives put out by the fake media (CNBC, etc.) has been going for so long now the degree of damage that will occur in the next fall out may be unfixable, where you will literally not be able to recognize the US 5 years from now even if America is successful in fighting off the globalists, the silent invasion, etc. - where the United States of America won't be so united anymore. In this regard, it's important to realize the markets are stretched like never before, whether you want to look at either micro or macro data points (see here, here, here, here, and here), meaning the next time the big bubble comes under stress - the credit bubble - it might pop for good - which would change everything on a fundamental basis. (ex. no more last minute delivery [no warehousing today] supply chain - which depends on credit, no more consumer, no more economy.) So if you think economies have turned inward today - you haven't seen anything yet. This is why you need to be your own sovereign, your own manager, and liquor (credit) control board. Because if one doesn't watch your credit consumption and dependence moving forward, where far too many don't these days (individuals and corporates alike), you would be consumed under such conditions. No, it's important to realize you will likely never be 'rich', and that protecting what you have should be of paramount importance to you, not dreams of grandeur. So again, this is likely why you will be able to look back on 2017 as the year everything changed - where the system finally cracked - evidenced in the 'crack-up boom' under way right now. And again, even though the charts suggest further losses are likely on the way for precious metals in the intermediate term, which may in fact occur, still, despite this risk, there's the risk a change in 'fundamentals' make the message in these charts 'fake' too - so not having strong 'core positions' in physical metals is a 'fundamental error' in terms of portfolio planning. It never changes in the investing game - the few cannot pay the many - the many must pay the few. Right now, it's 'trendy and popular' to have paper stocks, bonds, and even precious metals. My big prediction for 2017, the Year of the Rooster, is that by the end of this year, you will look back and say this was the year of paradigm change, where the vulgarities of fake popped paper bubbles become apparent to all, and physical possession of wealth becomes of ultra importance as the last vestiges of trust in central planners (fascists, liberals, etc. ), and unfortunately for Donald Trump, the 'big state', is damaged irreparably. It may not become apparent on the surface to all, however if physical precious metals are able to break the shackles of the COMEX control structure, anything is possible. And again, as alluded to above, if this needs to occur because the physical settlement market for precious metals in China starts building in premiums the boys in New York can't deal with - then so be it. 2017 will go down as the Year of the Rooster in the history books - as it were. The excitement that many Republicans have experienced this week—and the corresponding dread felt by many Democrats—isn’t just a product of President Donald Trump’s blusterous personality and cyclonic path to the White House. It also arises because, for the first time since 2011, one party will now control the executive branch and both chambers of Congress. We are so used to blaming Washington’s failures on partisan gridlock that the prospect of three horses pulling in tandem seems to promise radical change, for better or worse. Certainly, the most productive administrations of the past century—those of Woodrow Wilson,Franklin Roosevelt and Lyndon Johnson—have featured presidents who were adept at leading Congress and whose parties enjoyed large majorities for at least a couple of years. But controlling the White House and Congress is no guarantee of success. As often as not, presidents who have enjoyed one-party rule have found themselves at war with their fellow partisans on Capitol Hill. Like the prospectors in “The Treasure of the Sierra Madre,” who finally find their long-sought cache of gold only to turn on one another, so party leaders who attain united power frequently wind up quarreling and squandering their opportunity. Inexperience, institutional conflicts, ideological rifts, personal animus—all have served to fracture parties in power that might otherwise have worked their will in Washington. Consider the case of 1953. The wildly popular Dwight Eisenhower had won the presidency for the Republicans for the first time since 1928, and his coattails brought in congressional majorities. Only twice before in U.S. history had a party shut out of power claimed the presidency and both chambers of Congress in one stroke. The Republicans’ margins were slim, but then as today, GOP leaders were giddy at the thought of rolling back what they called the “creeping socialism” of the preceding 20 years. On some issues, GOP stalwarts got what they wanted: tax breaks, privatization of atomic energy, the construction of the St. Lawrence Seaway on terms favorable to private developers. But on others—including the big issue of the day, foreign policy—Republicans clashed. Eisenhower had run for president in large part because he feared that his party would to return to its prewar isolationism. He had faced down a nomination challenge from Sen. Robert Taft, who had been an America Firster before World War II and opposed the creation of NATO after it. By contrast, Eisenhower shared the belief—then more widely held among Democrats—that the countries of the world depended on one another for security and that the U.S. must lead the postwar order. The earliest fights between the two GOP camps came over appointments. During the campaign, Eisenhower had muted his criticisms of Sen. Joseph McCarthy, whose reckless accusations of Communist influence were then at their zenith. McCarthy didn’t reward Ike’s restraint. On Eisenhower’s second day in office, McCarthy used a Senate hold to block the appointment of Walter Bedell Smith, Ike’s wartime chief of staff, as undersecretary of state. McCarthy did likewise when Eisenhower named Harvard President James Conant as high commissioner to Germany. And when Eisenhower nominated Charles “Chip” Bohlen, a distinguished Foreign Service officer, as ambassador to Moscow, Senate conservatives mounted a full-scale assault. Bohlen got through, but only after a bruising fight. On policy, Ohio Sen. John Bricker, another conservative leader, championed a constitutional amendment to limit the president’s power to make treaties. The so-called Bricker Amendment was anathema to internationalists, but almost all congressional Republicans backed it, as did enough Democrats to ensure passage. 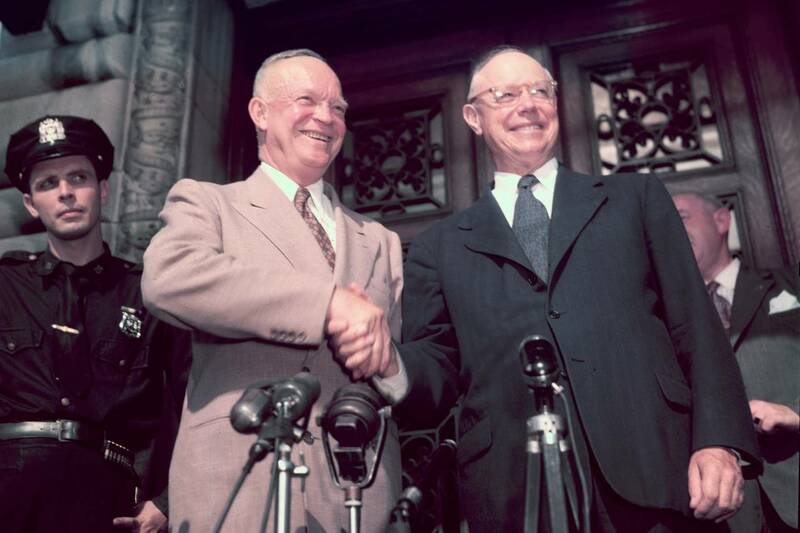 An irate Eisenhower publicly warred with Bricker, who was backed by conservative interest groups from the Chamber of Commerce to the American Legion. Eventually Ike reached across the aisle, enlisting the Democratic Senate minority leader, Lyndon Johnson, to devise an elaborate strategy to defeat the Bricker Amendment on the Senate floor. Congressional Republicans fought with the new president in other areas too—including foreign aid, trade and immigration. Eisenhower’s nominee as chief justice of the U.S., Republican Gov. Earl Warren of California, was assailed by Sen. Barry Goldwater as a socialist. When John Kennedy entered the White House in 1961, it was the Democrats’ turn to bicker. The party’s majorities in both houses of Congress rested on a sizable bloc of Southerners, many of whom were at least as conservative as the average Republican. Meanwhile, liberals were eager for change and tired of compromising with the Southerners. Kennedy got it from both ends. The most acute problem was civil rights. Kennedy had eked out his 1960 victory thanks in part to a phone call he made to Coretta Scott King when her husband, Martin, was in jail—a clarion signal about whose side the candidate was on in the great fight of the day. But in his first years as president, JFK worried that antagonizing the Southern barons would cost him support for his economic plans and other projects. When Kennedy sent a modest civil-rights bill to Capitol Hill in 1962, Democratic Majority Leader Michael Mansfield told him that it would never pass. It died by filibuster. Kennedy didn’t seriously push civil-rights legislation until the 1963 Birmingham crisis. King and his Southern Christian Leadership Conference had launched a campaign to desegregate the Alabama city, which culminated in May 1963 when police chief Eugene “Bull” Connor used attack dogs and high-pressure fire hoses against protesters, resulting in gruesome images broadcast world-wide. The brutality, along with mounting liberal ire, persuaded Kennedy to send a meaningful desegregation bill to Capitol Hill. Nor was the resistance of Southern Democrats the only obstacle. At one point, following the September church bombing in Birmingham that killed four black girls, Rep. Emanuel Celler of Brooklyn and other liberals so toughened up the bill that the administration feared its whole legislative strategy would unravel. The bill had barely gotten out of committee when Kennedy was assassinated in November. Kennedy faced opposition within his own party on other issues. His main 1960 campaign pledge had been to “get America moving again” after the anemic economy of Eisenhower’s second term. After much division within his administration, Kennedy arrived at a plan in January 1963 to cut taxes and try to spark employment growth. But as the historian Irving Bernstein noted, “the Ways and Means Committee moved with glacial speed.” The committee’s fiscally conservative chairman, Rep. Wilbur Mills of Arkansas, essentially rewrote the bill, gutting Kennedy’s most cherished proposals. Like JFK’s civil-rights bill, his economic-growth legislation would also fail to win passage until after Nov. 22, 1963. One-party rule proved no less frustrating for the Democrats in 1977. Even more than Eisenhower and Kennedy, Jimmy Carter was hamstrung by his inability to coordinate with his congressional party-mates. A virtual unknown only a year before his election, the onetime Georgia governor had run and won on his outsider status. Meanwhile, after eight years of Richard Nixon and Gerald Ford, Democratic congressional leaders were eager to pass their agenda—and suspicious of the pious, Southern, Washington-bashing interloper in the White House. Mr. Carter made matters worse with rookie mistakes in treating his ostensible allies. House Speaker Tip O’Neill found Mr. Carter’s stripped-down style disrespectful—feting members of Congress, for example, with paper plates. The president also neglected to tell legislators when he was appearing in their home districts, causing embarrassment and wasting opportunities to bank easy political points. More significant than the symbolic slights were the legislative struggles. Mr. Carter took a dim view of congressional liberals’ expansive Great Society visions and free-spending ways, but he had promised a $50 tax rebate to every American—an economically dubious gimmick with high public-relations value. After the rebate passed the House, however, Mr. Carter abandoned it, leaving legislators looking like fools. Making matters worse, the White House eliminated $5 billion in funding for dams and other water projects in an early appropriations bill, in the name of budget cutting and environmental protection. But many of these projects resided in the districts of influential Democrats, and Mr. Carter had put them on the chopping block without warning. In 1977, the president called on Congress to vote on the unpopular Panama Canal Treaties, which ensured the canal’s neutrality (meaning that the Soviet Union could use it) and gradually transferred sovereignty from the U.S. to Panama. Most Democrats felt obliged to support the president, but they resented having to walk the plank for a deal that would bring them little benefit. The final straw may have been Mr. Carter’s rejection of a universal health-care plan pushed by Sen. Edward Kennedy of Massachusetts. The president first delayed action on the bill, then backed a more modest plan that relied on private insurance. At one point, he told Kennedy that he didn’t plan to make health-care reform a priority at all. Eventually, Kennedy would challenge Mr. Carter for the 1980 Democratic nomination—the ultimate expression of the rift. Among more recent presidents who have held both houses, Bill Clinton,George W. Bush and Barack Obama have all found securing support from their own parties harder than they imagined. Mr. Clinton’s health-care plan went down to defeat in 1994 not just because Republicans lined up against it but also because congressional Democrats overreached and failed to deliver. Both liberal and moderate Democrats insisted on provisions that the other side couldn’t abide, leaving Mr. Clinton with a compromise plan that no one wanted to rally behind. Mr. Bush, for his part, began his second term pledging to spend the political capital from his 2004 victory. But his ambitious plan to partially privatize Social Security ran aground when key Republicans—notably House Ways and Means Chairman Bill Thomas—balked. Mr. Obama got a lot of bills through a Democratic Congress in the first two years of his presidency, but he too fought with his own party’s leaders—both on his health-care bill and the 2009 stimulus bill. At one point during the drafting of the stimulus bill, the president was on speakerphone with House Speaker Nancy Pelosi, trying to exhort the Democratic troops—leading Mrs. Pelosi to press the phone’s mute button so that her congressional team could get back to work without his noticing. What about Donald Trump? He may well end up tangling as much with his own party as with his Democratic opposition. In his campaign, he badmouthed or alienated most leading Republicans in Washington, and though some wounds have been patched, many more still fester. 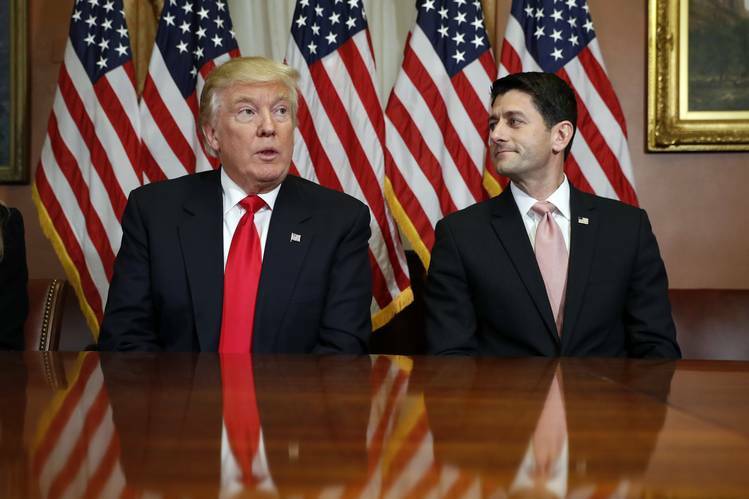 Early on, Mr. Trump called out House leaders for a plan to defang their ethics committee, quickly scuttling the move. The Russian hacking scandal, which Mr. Trump has largely dismissed, has led key senators such as John McCain to support congressional investigations. And many members of the House’s Freedom Caucus have vowed to oppose Mr. Trump’s plans for infrastructure spending. Mr. Trump lacks, too, not only the overwhelming majorities that would insulate him from some intraparty dissent but also the leadership qualities that his most successful predecessors exhibited. He has neither Wilson’s deep understanding of government, nor Roosevelt’s easygoing charm, nor Johnson’s years of experience mastering the byways of the Senate. But the incentives for cooperation are strong. Mr. Trump and the Republicans must realize that their window to enact significant change is small and that the best way to extend it is to score some big victories early on. For all their divisions, they have every incentive to compromise and collaborate. Of course, so did Eisenhower and Robert Taft. Mr. Greenberg is a professor of history at Rutgers University and the author, most recently, of “Republic of Spin: An Inside History of the American Presidency,” now out in paperback from Norton. Will Trump Use a Cheaper Dollar to Boost U.S. Exports? If Trump wants to alter the terms of foreign trade, dollar devaluation would be a simpler means than imposing tariffs or changing tax policy. Meet the new boss, definitely not the same as the old boss. But will we get fooled again? With apologies to the Who’s Pete Townshend, Donald Trump served notice that change is coming to the White House at his inauguration Friday. And it can be summed up in two words: America first. Every decision on trade, taxes, immigration, and foreign affairs will be made to benefit the U.S. and to protect the nation from “the ravages” of foreign competition, the new president vowed in his inaugural address. “Protection will lead to great prosperity and strength,” he added. Maybe “protection” isn’t the same as “protectionism,” but the differences seem hard to discern in this case. “We will follow two simple rules: Buy American and hire American,” the new president emphasized. Already during the interregnum between Election Day and Inauguration Day, Trump cajoled auto companies to move or keep production stateside (while also criticizing pharmaceutical makers and defense contractors for charging what he deems too much). Until Friday, he had only the bully pulpit as a means to put America first. Now, after being sworn in as the 45th president, he actually has the power to further that aim. Simpler and quicker than tariffs or tax changes would be to alter the terms of trade via the currency market. The dollar is “too strong,” Trump flatly told The Wall Street Journal in an interview. While it marks an about-face from the “strong dollar” mantra chanted by U.S. administrations for more than two decades, since Bill Clinton’s Treasury Secretary Robert Rubin, it fits with Trump’s America-first credo. 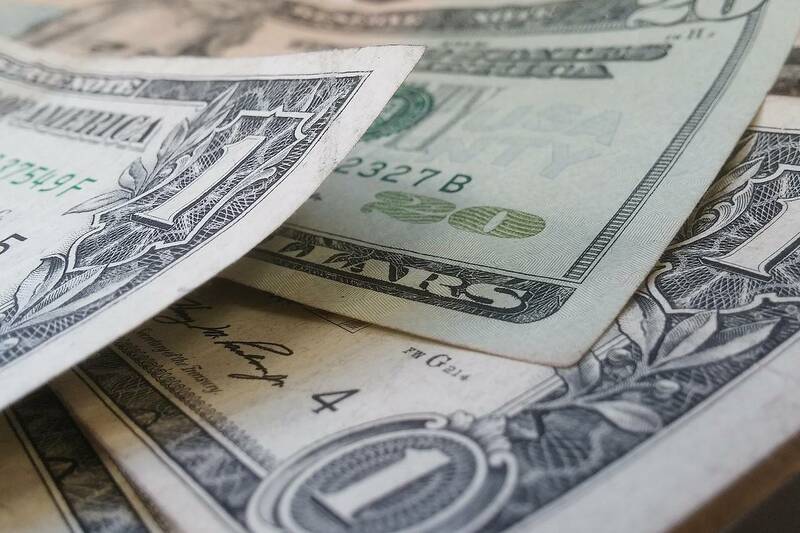 It recalls a similar stance famously espoused by John Connally, Richard Nixon’s Treasury secretary, who in 1971 declared to the rest of the world that the dollar was “our currency, but your problem.” Nor have calls to lower the greenback been unique. During the Jimmy Carter administration, Treasury Secretary W. Michael Blumenthal similarly called for a cheaper buck to boost U.S. competitiveness and narrow the trade deficit. Swings in the dollar—both sharply higher, as in the 1990s and during the past two years, and sharply lower, as occurred in the years following the financial crisis—are hugely disruptive to the rest of the world. Probably more so than for the U.S. economy, which is relatively closed, compared with those of other nations that are vitally dependent on foreign trade. In 1967, the United Kingdom’s prime minister, Harold Wilson, tried to convince Brits, when sterling was devalued, that the pound notes in their pockets were still worth the same—even though they purchased only $2.40, rather than the previous $2.80. For most U.S. consumers, whether the euro fetches $1.10 or $1.20 doesn’t matter much; maybe if they go on vacation abroad, but not on their weekly trek to the supermarket. Trump once again insisted that the dollar’s overvaluation was largely a result of China’s deliberate undervaluation of its currency, the yuan. When the Journal pointed out that China’s monetary authorities actually have been acting to boost the yuan, Trump responded that they were just trying to avoid angering the U.S. Whatever the motivation, Chinese authorities have clamped down on capital flight, after having spent approximately $1 trillion in foreign-exchange reserves to slow the yuan’s decline—the opposite of manipulating its currency to gain a trade advantage. To be sure, Steven Mnuchin, Trump’s choice for Treasury secretary, walked back his likely future boss’ implicit call for a cheaper dollar during his Senate confirmation hearing last week. That wasn’t the only time Trump’s cabinet choices voiced views consistent with more generally accepted opinions (although not necessarily congruent with those of the new president), extending to matters ranging from Russia to global warming. But to make America first, Trump’s initial plan is to debase the dollar. That would induce everyone to “buy American and hire American.” As Greg Valliere, chief strategist of Horizon Investments, notes, the inaugural address was conspicuously lacking mentions of tax cuts or tax reform. Those were the main things the financial markets wanted to hear, and what they have rallied on since the election. But it seems that actions on the tax front won’t be coming until later this year. And that would be “later than the markets would prefer,” he adds, even if their expectations were unrealistically optimistic. TRUMP’S DESIRE FOR A WEAKER DOLLAR clashes with GOP plans for fiscal stimulus through tax cuts and infrastructure spending. Those actions would lead to higher growth in gross domestic product and inflation, both of which tend to push the buck higher, not lower. That would increase the odds that the Federal Reserve would move forward with interest-rate increases. Based on the policy-setting Federal Open Market Committee’s dot-plot graph of members’ expectations for the federal-funds target range released last month, they look for three quarter-point hikes by the end of 2017. Trump’s statement favoring a softer dollar initially pushed rates lower, since that implied a slower pace of Fed tightening. But after Yellen’s comments, they reverted, with the benchmark Treasury 10-year note hovering just under 2.5%. While the markets’ attention is centered on the new administration, it would be a mistake to ignore the Fed. “If you merely watched Reagan in his early months and not the Fed, you would have been caught in a 25% bear market that didn’t end until the fall of 1982,” David Rosenberg, chief economist and strategist at Gluskin Sheff, points out. “As with Reagan, the good stuff may end up awaiting the second half of his first term,” he adds. “Anyone who has been in the markets long enough knows how important Fed liquidity is—it is the prime reason why the S&P 500 tripled under Obama’s tenure. “It is not Trump’s policies that will influence the contours of the business cycle or market performance looking ahead, but the Fed’s reaction function,” Rosenberg continues. In other words, how will Yellen & Co. react to incoming data and the impact of policy moves on growth and inflation? But more than the numbers, the Fed cannot help but feel the influence of the new administration. Last May, candidate Trump said he would most likely replace Yellen if he were elected, because she isn’t a Republican. By September, in a debate with Hillary Clinton, he charged that the Fed chair was “doing political things” by keeping rates low. “When they raise interest rates, you’re going to see some bad things happen because they’re not doing their job,” he added. That’s because, he claimed, the economy was in a “big, fat bubble.” He warned of a stock market slide when the Fed tightened. Whether he still believes that is uncertain. But further rate hikes, all else being equal, would tend to lift the greenback. While Yellen’s term ends in January 2018, there are currently two vacancies on the Fed’s Board of Governors, which is supposed to consist of seven members, including her and Vice Chairman Stanley Fischer, whose term ends in June 2018. So, the White House could exert a lot of influence on Fed policy with personnel decisions in the next year or so. But in what way? Many Trump supporters fault the Fed for holding interest rates too low for too long. On the other hand, higher rates could blunt the impact of future tax cuts and infrastructure spending, while boosting the dollar. While rates remain historically low, some critics contend that the Fed may have tightened policy too much already. Paul Kasriel, the former chief economist at Northern Trust who currently pens his Econtrarian blog as senior economic and investment advisor at Legacy Private Trust in Neenah, Wis., notes that the Fed has tightened since it ended its quantitative-easing program in 2015, with an outright contraction of the monetary base (reserves and currency) last year. Banks also slowed credit expansion markedly throughout 2016. What “could stimulate thin-air credit growth would be a sharp increase in federal credit demand, resulting from tax cuts and/or discretionary spending increases,” he continues, which is what the stock market is anticipating. All else being equal, that would mean higher interest rates. “It is not a question if significant federal tax cuts are coming in the next two years, but when and how the Fed will react to them,” Kasriel concludes. If the reaction is to lift the fed-funds rate, that not only could blunt any stimulus from the fiscal side, but also lift the dollar further. The outcome may not be what stock market bulls hope as the Dow Jones Industrial Average remains frustratingly short of the 20,000 mark. WASHINGTON, DC – The late British historian Eric Hobsbawm famously called the period between Archduke Franz Ferdinand’s assassination in 1914 and the Soviet Union’s collapse in 1991 the “short twentieth century.” For Hobsbawm, the end of the Cold War marked a new and distinct era in world affairs. Now, with more perspective, we should reconsider this classification. Rather than constituting a break from the past, the quarter-century following the fall of the Berlin Wall actually turned out to be a continuation – indeed, a culmination – of what came before. But Donald Trump’s inauguration as President of the United States represents a definitive break from the past; the long twentieth century has now come to a close. It is too early to guess what will come next, just as it was in June 1914. Since Trump’s election victory, one popular prediction is that the world will revert to nineteenth-century spheres of influence, with major players such as the US, Russia, China, and, yes, Germany, each dominating their respective domains within an increasingly balkanized international system. The top-down, strongman model that seems to be in ascendance today does not portend the future; rather, it is a last gasp from an earlier time – a nostalgic rehash of an obsolete model. In 1994, Hobsbawm believed that there could “be no serious doubt that in the late 1980s and early 1990s an era in world history ended and a new one began.” But it is now clear that the subsequent period, between the early 1990s and today, marked the culmination of a process that began in Sarajevo in 1914. That process gradually built the liberal international order, first with an aborted attempt after World War I – embodied in the ill-fated League of Nations – and then after World War II, with the founding of the United Nations and the Bretton Woods institutions. In the post-Cold War period, the flower came fully into bloom as democracy and free markets spread around the globe. This model held a moral umbrella over the existing Westphalian state system, by creating a universal structure within which national governments could collaborate in the pursuit of progress. For most of the twentieth century, this framework applied only to a core group of countries; but with the end of the Cold War, it was suddenly available to all. And yet, just when this moral order was in a position to be fully realized around the world, it lost its center and began to drift. Free markets and material prosperity, once regarded as means to larger ends, had become ends in themselves. The 2008 financial crisis revealed the soullessness of this approach, and set the stage for the unraveling on display today. The second possibility, epitomized by the European Union’s leaders, is to continue down the twentieth-century path, but with more rhetorical flourishes. The third, comprising perhaps the largest camp, is to retreat below deck and wring one’s hands, bemoaning the expulsion from paradise and fearful of a looming apocalypse. None of these responses is constructive. We cannot return to the world of yesterday or simply stand still; and we do not yet know what the world of tomorrow has in store for us. When sailors cannot rely on maps or charts, they must navigate by sight, and that is precisely our situation today. Until the world regains its bearings, this is not the time to charge in bold new directions, or to let the currents push us toward potential hazards. Instead, we need decisive, concrete action that addresses tangible and discernible problems in governance and public policy. Before we can move forward into this brave new world, we must first reestablish the idea of common purpose – and wait for the fog to lift. Nobody can yet say if it will be a time of conflict or harmony, advancement or retrenchment. But, before attempting to chart a new course forward, we must make our way into calmer waters. China wants to have the Philippines as an ally, and the Philippines wants to decrease its dependence on the United States. Philippine President Rodrigo Duterte’s recent behavior suggests that a partnership with China is possible. However, the Philippines also needs protection from China’s aggressive or expansionist moves in the South China Sea, which threaten Philippine territorial claims. Until either Manila or Beijing is willing to give up on those claims, a Chinese-Philippine alliance will remain out of reach. Forging an alliance with the Philippines would strengthen China’s strategic position and weaken the U.S.’ strategic position in the Pacific. Duterte’s perceived madness and willingness to open a dialogue with China suggest that China and the Philippines could forge closer ties. China and the Philippines have conflicting imperatives: Both claim sovereignty over some of the same islands in the South China Sea, and neither wants to give up those claims. Its economic relationship with the U.S. is important for the Philippines, and the U.S. is also its security guarantor against a much stronger and increasingly aggressive People’s Republic of China. The Philippines is leveraging its weak position to get more from the U.S., not to realign with China. China wants to use the Philippines because a Chinese-Philippine alliance would solve China’s main strategic weakness – the various choke points around its coast that it cannot currently control. The U.S. wants to continue to use the Philippines as a key part of its naval strategy in the Pacific, like it has for decades, because the Philippines is highly valuable strategic territory and Philippine alignment with the United States is a key part of U.S. naval dominance in the Pacific. The Philippines wants to gain some degree of independence in its foreign policy, and that means not being too dependent on any outside power. At present, the Philippines is extremely dependent on the United States, Manila’s most important economic and military partner, despite whatever Duterte may say to the public. There will be continued tension and fireworks at the upper diplomatic level, but the fundamentals of the U.S.-Philippine relationship will remain in place for the foreseeable future. The cost for China of securing an alliance with the Philippines is too high for either China or the Philippines to bear. China has a key geopolitical imperative: maintaining its access to the sea-lanes that enable it to export its goods to the global market. China faces three key challenges to this imperative. The first is geographic. Shipments from the country’s ports must transit through a series of islands. 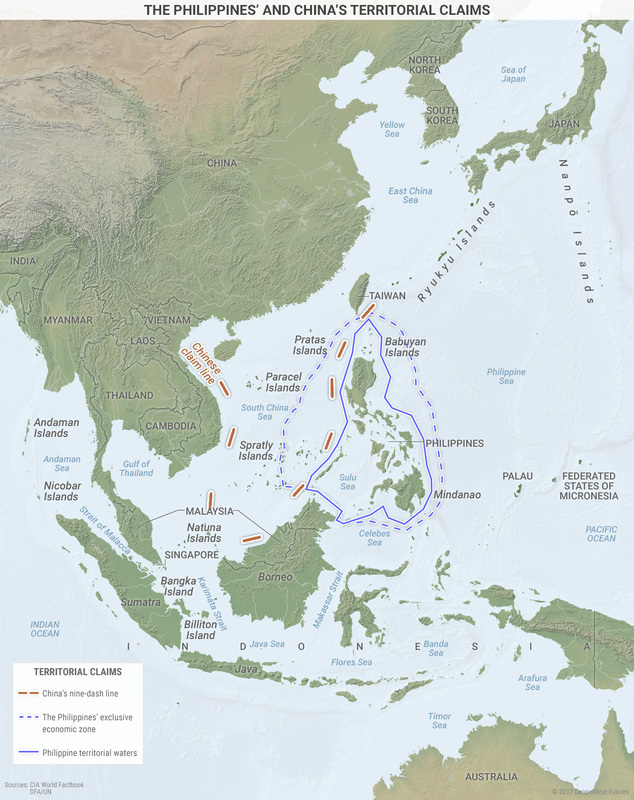 These island chains, of which the Philippines is one of the largest, act as potential choke points that could directly threaten China’s access to maritime trade if held by an outside power. Without this trade, China’s economy would enter a crisis. The second challenge is that the Chinese navy does not have the capability of projecting force at the distance necessary to secure these choke points. China only this past year saw its lone aircraft carrier, the Liaoning, make its maiden voyage, and China has a significant way to go before it is capable of operating carrier battle groups. The short range of its aircraft and its diesel-powered submarines are also limiting factors. This is one of the reasons China is building runways and small bases in places like Subi Reef and Fiery Cross Reef. Third, China faces a challenger in its own backyard with a naval force far more capable than its own: the United States. Furthermore, the U.S. is not alone as it counts among its allies Japan, South Korea and Taiwan, all with significant military capabilities that could be brought to bear in any potential conflict. Currently, China has very few options in ensuring its imperative to maintain access to global markets, beyond playing by U.S. rules. China, like all countries, would like to be master of its own fate and is therefore engaged, on multiple fronts, in trying to overcome these challenges. This includes pushing military development at home and asserting its sovereignty claims in the South China Sea. However, China could try to flip one of the U.S. allies or find an ally in the region to give the Chinese guaranteed access to the world’s oceans and a place for China to station significant naval and air assets that would greatly increase China’s ability to project force at a distance beyond the Chinese mainland. The Philippines is an excellent candidate for this at first glance. Duterte’s harsh criticism of the U.S. and his willingness to explore the possibility of strengthening Chinese-Philippine relations represents a significant opportunity for the Chinese, one that could strengthen China’s strategic position immensely while simultaneously dealing a serious blow to U.S. power projection capabilities. When Duterte visited China last October, China rolled out the red carpet for him. Duterte left with promises of $24 billion worth of Chinese investment, which Philippine Trade Secretary Ramon Lopez touted as potentially bringing 2 million jobs to the Philippines in the next five years. If money were all it cost China to secure a relationship with Duterte’s Philippines, China would spend it – gaining the Philippines as an ally would, from China’s strategic perspective, be worth spending the entire Chinese defense budget. The problem is that solidifying an alliance with the Philippines will cost China more than money; it will also cost land over which China claims sovereignty. Both Duterte’s rhetoric and last October’s Chinese investment deals made headlines across the world. Less noticed at the time was that Duterte left China without an agreement that Philippine fishermen would be allowed to once again fish around Scarborough Shoal, disputed territory between China and the Philippines that China has restricted Philippine access to since 2012. A Philippine official who accompanied Duterte on the China visit noted to local Philippine media that no agreement was reached on Scarborough Shoal fishing rights because China insisted on language saying that Philippine fishermen would be “allowed” or “permitted” to fish near Scarborough Shoal. In effect, this language would have required the Philippines to recognize Chinese sovereignty over Scarborough Shoal, contradicting a recent ruling over sovereignty rights by the Permanent Court of Arbitration that was favorable to Philippine claims. Duterte, as much as he courted the Chinese, was not willing to sign such an agreement on those terms and instead left empty-handed on the fishing front. 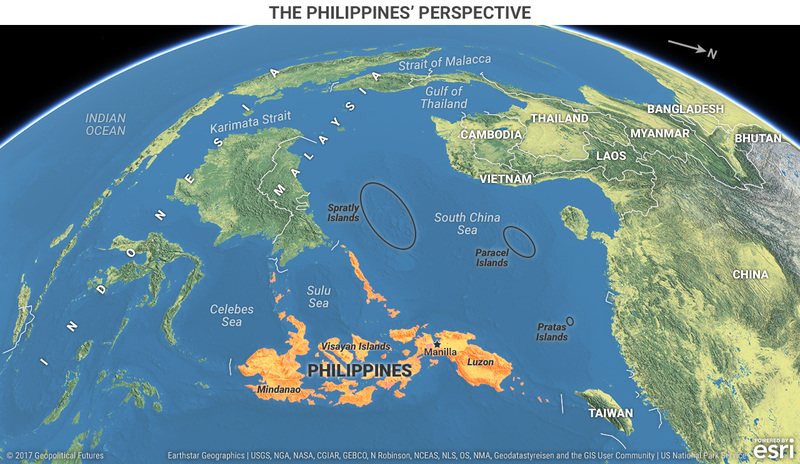 As the above map shows, China and the Philippines disagree about a large group of islands in the South China Sea. (This map does not show other claimants, such as Taiwan, Vietnam and Brunei). China’s President Xi Jinping uses nationalism to maintain the legitimacy of the Communist Party, and Chinese students learn that territory within the so-called “nine-dash line” shown above is China’s sovereign territory. Therefore, the Chinese people likely would not support a policy that includes forfeiting islands they see as belonging to their nation. China wants to secure its access to maritime trade routes, but it will not give up sovereign territory to do so, especially now that the issue has been magnified by the recent international tribunal ruling. Giving in now would prompt memories of all the times China previously bowed to foreign wishes regarding Chinese territory – frustration over that very issue was one of the many forces Mao Zedong and the communists used when they rose to power. The Philippines, like China, is also a proud and nationalistic country with a less-than-savory memory of Western imperialism. Of course, the United States was the Philippines’ last imperial master, but the U.S. currently has no interest in taking control of Philippine territory. The U.S., which was critical of Duterte under the administration of President Barack Obama over human rights issues, desires an ally that will allow it to station military equipment there to strengthen its power position in the Pacific. It is China that is encroaching on the Philippines’ territory today, and the Philippines is powerless to stop it. Duterte, it should be remembered, came to power with a great deal of support from his people, and his message is about increasing the nation’s security and strength. He is not interested in giving up territory to the Chinese. The results of a 2014 Pew Research Center study help to bear this out. The study found that only 38 percent of Filipinos had favorable views of China, while 92 percent had favorable views of the United States. The reason for this is simple: China is much closer to the Philippines and claims territory that Manila believes belongs to the Philippines. China’s proximity and its territorial claims are not the only reasons the Philippines is wary of China. The Philippines is also much weaker than China. The Philippine military is dwarfed by the Chinese military, and the Philippines depends on the U.S. for its external defense. For one thing, the Armed Forces of the Philippines (AFP) has its hands full with domestic issues, such as a Muslim insurgency in the south. Duterte said he wants the AFP to become involved in his government’s war against the country’s illicit drug industry. Duterte also wants to increase Philippine military spending by 14 percent to $2.9 billion this year. China’s precise defense spending is unknown, but its publicly disclosed defense spending for 2015 totaled $146 billion, whereas the U.S. Department of Defense estimated it at $180 billion and the Stockholm International Peace Research Institute at $214 billion. Even assuming the low figure, China spends almost 50 times more on its military per year than the Philippines. In terms of overall naval capability, the Philippine navy pales in comparison to the Chinese navy, relying mostly on refurbished U.S. Coast Guard cutters as the Chinese continue to build advanced new frigates and destroyers at an impressive pace. When China restricted Philippine access to Scarborough Shoal, the Philippines was powerless to resist. Recent diplomatic events highlight the fundamental underlying tension between the Philippines’ desire to ally with China and its desire to regain control of its territory. The Philippine foreign minister said on Dec. 16 that the Philippines had no intention of protesting Chinese moves to install new anti-aircraft and anti-missile systems on some islands in the disputed region. Exactly one month later, the same foreign minister revealed that the Philippines had indeed filed a diplomatic protest in the form of a note verbale over China’s moves in the South China Sea. The foreign minister sought to downplay the dispute, but the next day the Philippines’ defense minister said that China’s moves toward militarization are “very troubling” and that the Philippines needs to protect its national interests. Last week, Japan’s Prime Minister Shinzo Abe traveled to the Philippines to present Duterte with a new aid package and, per the Japanese Foreign Ministry, secured an assurance from Duterte that Philippine cooperation with the U.S. would continue. The Philippines is not only dependent on the U.S. from a national security perspective. Both in terms of trade and foreign investment, the United States is a very important partner for the Philippines. China has become increasingly important in recent years, but the U.S. remains the dominant partner. Underscoring how much the Philippines will lose if it separates from the United States under the current circumstances is the number of U.S. allies that also have relationships with the Philippines. China has the most economic leverage in terms of products imported by the Philippines. In 2015, just over 16 percent of all goods imported by the Philippines came from China; this number increases to just over 19 percent if Hong Kong’s exports to the Philippines are added. The U.S. is the second largest source of goods imported by the Philippines, accounting for 10.9 percent of total imports. 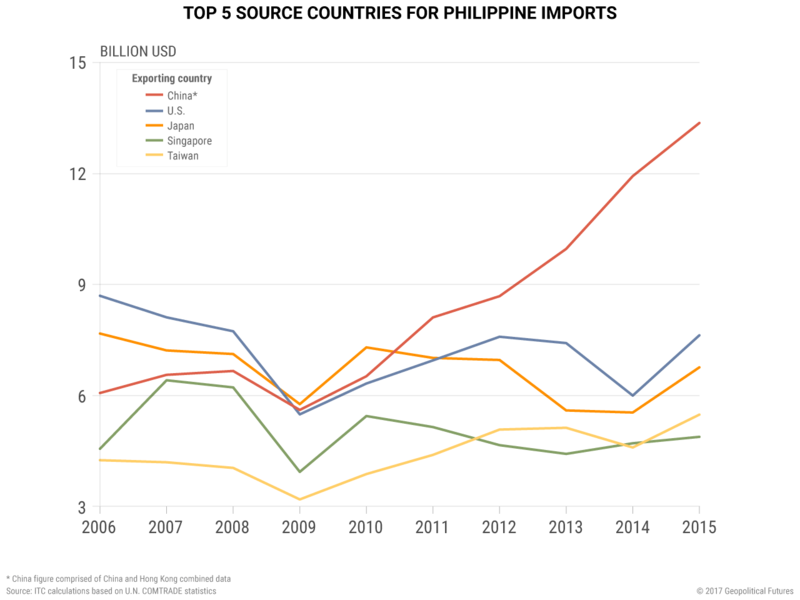 Other major U.S. allies – which is to say other powers in the region that oppose China’s moves in the South China Sea, including Japan, Taiwan and South Korea – are also important supplying markets for the Philippines. 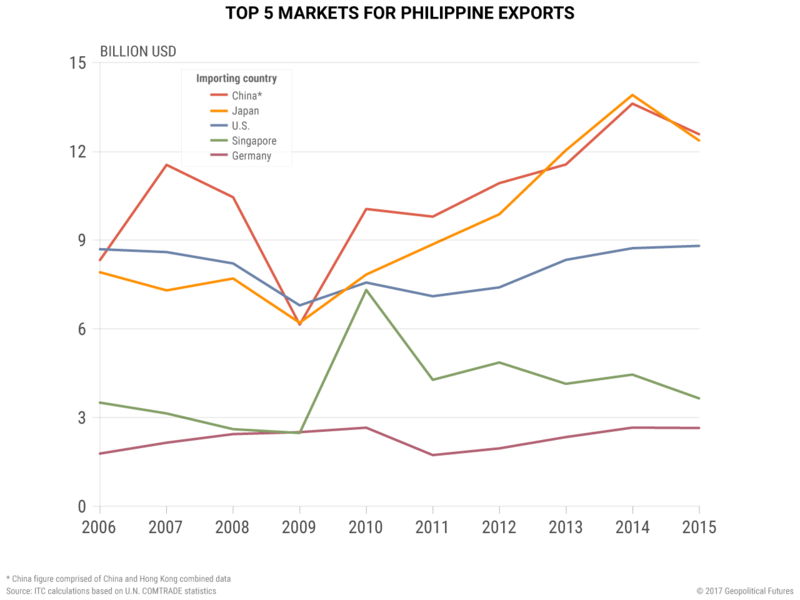 Together these four nations make up just under 35 percent of Philippine imports. One thing to note is that China only took over as the top Philippine supplier in 2011 (when factoring in Hong Kong’s exports). Since 2006, Chinese exports to the Philippines have doubled while U.S. exports to the Philippines have decreased by 12.3 percent. The Philippines has a moderate dependence on exports, which accounted for 28 percent of GDP in 2015. However, the Philippines has been weaning itself from export dependence in recent years. Exports reached a peak of 51.4 percent of GDP in 2000, but the Philippines has cut that dependence almost in half. In 2015, China’s and Hong Kong’s combined figures made China the top importer of Philippine products, accounting for about 21.4 percent of all Philippine exports. China and Japan have traded this title back and forth in recent years; in 2015, Japan was the export destination for 21.1 percent of all Philippine products. Here, too, the U.S. role has slowly diminished over time. In 2006, for example, the U.S. was the largest market for Philippine exports and accounted for 18.3 percent of total Philippine exports at the time. The U.S. market now only comprises 15 percent of Philippine exports. While China is technically the largest trading partner for the Philippines, many of the Philippines’ other trading partners are U.S. allies and don’t want to see the Philippines and China develop a close relationship. The story is similar for foreign investment. According to the Philippine Statistics Authority, total foreign investment in the Philippines was roughly $4.9 billion in 2015. China was not among the Philippines’ top 10 foreign investors in 2015, and through at least the first quarter of 2016, that didn’t changed. The Netherlands is by far the largest investor in the Philippines, followed by Japan, the U.S. and Singapore. This represents some degradation in U.S. influence – in the 1970s and ’80s, for example, the U.S. was by far the largest investor in the Philippines. The point, however, remains: China is not a large investor in the Philippines, and many large investors are countries that would react negatively to a Sino-Philippine alliance. Meanwhile, the U.S. is responsible for roughly 10 percent of foreign investment in the Philippines – not one of the largest investors, but still important. It remains to be seen whether China’s pledge of $24 billion worth of investment in the Philippines comes to fruition, especially considering that Duterte has not toed the Chinese line on sovereignty disputes in the South China Sea. If money and trade were the only issues, China could likely generate a significant amount of leverage in the Philippines, and China has been slowly increasing its share in Philippine trade over the past 10 years. 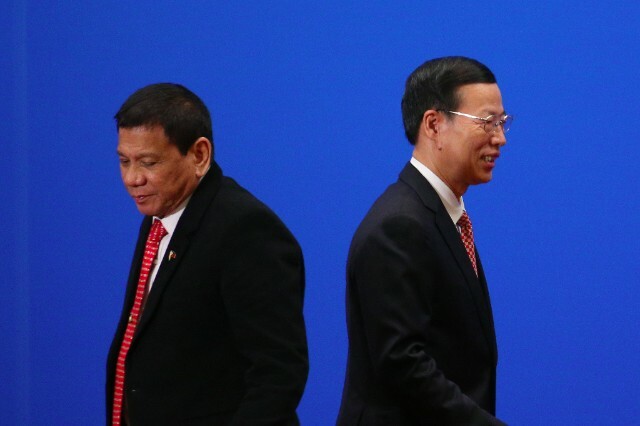 China has also shown that if Duterte would be willing to accept the Chinese position on sovereignty of the islands in the South China Sea, China would be willing to considerably increase its relatively small investment in the Philippines. The problem is that if Duterte were to accept China’s terms, he would have to give up Philippine sovereignty claims. Allying his country with China could also mean a great deal of economic difficulty, not just because of the U.S. response, but also because of other countries that would be unhappy about an alliance between Manila and Beijing. Duterte’s crass language offends some; his mercilessness in carrying out his self-declared war on drugs and corruption in the Philippines offends others. Many also attribute his mercurial personality and his colorful remarks to stupidity at best and raving lunacy at worst. Looking at Duterte’s actions instead paints a rather different picture, one of a smart, ruthless political leader attempting to play a weak hand to maximize benefits for the Philippines. At the global level, consider that until Duterte took office, fewer people around the world cared whom the Philippine president was or could name him. The Philippines is a militarily weak country in a dangerous neighborhood, and it faces a Chinese rival that outclasses it in terms of economic, military and diplomatic strength. The Philippines felt threatened and embarrassed, not just by China’s advances, which deprive Manila of what it considers sovereign Philippine land, but also by a lack of firm U.S. support for the Philippine position. Duterte has turned this position on its head by using the Philippines’ one major strength: the strategic importance of its location in the Asia-Pacific region. The Philippines is now being courted by the world’s great powers: China, Japan, Russia and the United States, all of whom are willing to accept Duterte’s outbursts on the chance that doing so might aid their chances of solidifying an old relationship with the Philippines or developing a new one. Despite U.S. officials insisting that all is well when speaking about the Philippines, despite the fact that Duterte or one of his underlings walks back his anti-U.S. comments each time he makes them, and despite the fact that the 1951 Mutual Defense Treaty signed by the U.S. and the Philippines remains in place, Duterte has injected a degree of uncertainty into the relationship with the United States, which is the Philippines’ main security blanket. When a country is as weak as the Philippines and depends on changing the behavior of a much stronger country, the weaker power must get creative. The one thing the Philippines can do is make U.S. policymakers and strategists doubt that it can be taken for granted, then make demands and hope that the doubt is enough to change the stronger power’s behavior. For months, the U.S. has been blaming Duterte for potential human rights abuses related to extrajudicial killings in the drug wars, and yet on Jan. 14, the U.S. State Department changed its tune, saying the U.S. was unable to verify human rights abuses in the Philippines. This is a small and relatively insignificant concession in the broader relationship, but the point is that Duterte has already succeeded in shifting the parameters of the relationship to be more responsive to his desires. This is a difficult gambit to continue, but thus far Duterte has done a good job maximizing the value of the Philippines’ geographic position in terms of diplomatic relations. The Philippines’ main problem with the U.S. is not that the U.S. has been too aggressive – it is that the U.S. has not been aggressive enough in countering China’s expansionist moves in the South China Sea. Duterte is exploring an alliance with China to decrease Philippine dependence on the United States, but the main goal of doing so would be to give Manila more leverage in its relationship with the U.S. The problem for Duterte and Xi is that China and the Philippines ultimately have a fundamental, mutually exclusive imperative. For Manila and Beijing to bury the hatchet, one side must give up sovereignty claims in the South China Sea. Neither side is going to do that, and at the end of the day, what the Philippines needs most is a United States that will defend the Philippines from China. Duterte expresses this sentiment when he criticizes the U.S. for focusing on alleged human rights abuses carried about by the Philippine government. The Philippines focuses on the shared imperatives that have made the Philippines and the U.S. treaty allies since 1951, and Duterte wants the U.S. to mind its own business when it comes to his domestic moves to solidify his power and undertake ambitious reforms. China wants to have the Philippines as an ally. The Philippines wants to become less dependent on the U.S. The United States wants the Philippines to behave as the U.S. wishes. However, desire does not determine reality. Until either China or the Philippines is willing to give up sovereignty claims in the South China Sea, it is hard to see how an alliance between Beijing and Manila could work. Until the Philippines develops a better military or finds a naval power capable of replacing the U.S. security guarantee, the Philippines will remain an American ally, if a reluctant and boisterous one. The U.S. has always been slow to learn that self-righteous moral indignation does not translate into strategically valuable action and will have to re-examine its approach to the Philippines if it wants the relationship to be based on anything more than superior strength and need. Duterte is likely to produce plenty more eyebrow-raising quotes, but until one of these variables changes, the Philippine relationship with China won’t progress much beyond a tease.